As we get ready for Advent, it is a time in which Christians throughout the world prepare to celebrate the birth of Jesus. 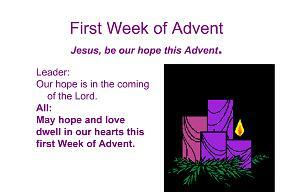 Advent is a time of expectation, waiting, and hope. Let’s watch the video to learn more about this Advent season. Meditation is an ideal way to pray. Using God’s Word (Lectio Divina) allow yourself time to hear, listen and reflect on the Sunday readings. What is the Lord saying to you in this reading? Take a moment to share your reflection and add your comment below. As we immerse ourselves in the season of Advent, over the next four weeks, I will share with you videos, music, and various presentations that I’ve located on the Internet. May these materials be an inspiration to you as you enjoy what others, who are like you, have created. If you like, you may forward the blog article to other catechists, parents, friends or anyone in your parish communities who would like to pause for a moment to prepare their minds and hearts over these next four weeks for the celebration of the Lord Jesus into our lives! A first week Advent Prayer that you can download to use with your class, Catechists, or RCIA group. 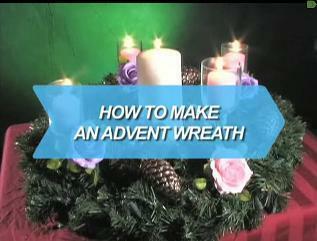 Check out – How To Make An Advent Wreath! Would love to hear from you how you may have used these materials in your class or parish! If you have created a YouTube video, or downloaded a PPT to Slideshare, tell us about your creation by sharing your story and link(s) with us in the response section of this week’s blog article.